"Research Questions and Matching Methods of Analysis"
The meeting took place in October 2002 in Perlora, Spain. The ongoing efforts of our Spanish colleagues, especially Ramón Pérez Pérez and Olga Pérez, made it possible for this meeting to take place at a wonderful retreat center in Perlora - just weeks before its beautiful beach was polluted by an oil spill. 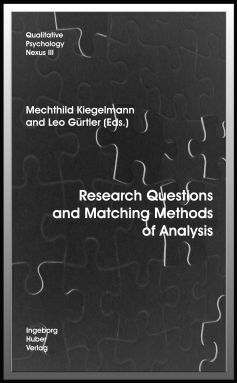 The opening section of this book documents how we began our discussion on matching research questions with methods of analysis: several authors illustrated their approach by analyzing the same text, namely the first chapter of Cervantes' book "Don Quixote." The various methods and research results presented in this opening panel provided an illuminating start for the ongoing discussions of how to apply research methods that are appropriate to the research question chosen. Then, during intensive parallel workgroups, speakers presented and discussed their individual papers in depth, using their own work to exemplify how they matched methods and research questions. The papers from these workgroups follow those analyzing Cervantes. Since a primary purpose of the Center for Qualitative Psychology is for researchers in this field to collaborate and to network, the third section of this issue of Qualitative Psychology Nexus includes documents produced within roundtable discussions at the workshop. These roundtables are a forum for researchers to connect, to discuss common interests, and to begin new joint projects. Part One: Don Quixote as "Data"